The elliptical is seen as a panacea if you require low-impact cardiovascular exercise during recovery from a knee injury or as a good way to cross-train to give your knees a break from higher-impact workouts. In some cases, such as when you suffer cartilage breakdown under your kneecap, the elliptical works well for this purpose. However, the biomechanics of these machines mean they are not ideal for your knees in every situation. An elliptical workout may lead to or worsen knee pain in some circumstances. The impact force of using an elliptical trainer is significantly lower than the force you experience when you walk or run on a treadmill. However, the shear forces on the knees — particularly when used at high resistance levels — is higher on an elliptical versus walking on a treadmill. Shearing forces put more stress on ligaments in the knee joint. That means the elliptical is not ideal for everyone seeking to spare the knees. 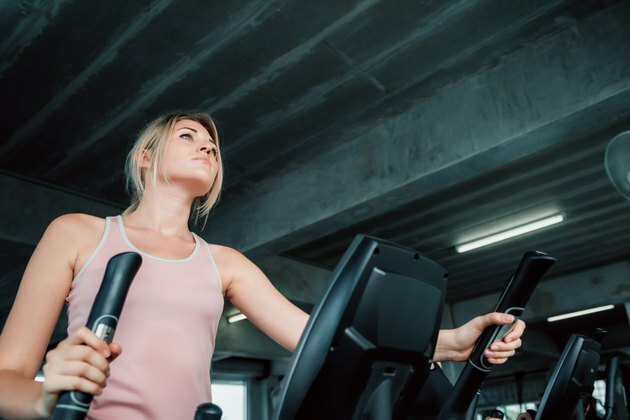 If you are suffering patellar tendinitis, using the elliptical may worsen your condition, and you may feel this as pain while exercising on the machine. This condition affects the tendon that connects your shinbone and kneecap, also called the patella. The patellar tendon aids your muscles in extending your lower leg, such as when you push bike or elliptical pedals. The first symptom of this condition is usually pain, which may be sharp during activity, according to the Mayo Clinic. Initially the pain is likely to be present during or just after an elliptical workout. The pain is likely to increase with your exercise intensity. As the condition progresses, pain may be present before, during and after exercise. The artificial motion of the elliptical machine may interfere with your natural biomechanics and cause knee pain during your elliptical workout. For example, if the base motion is inconsistent with your natural joint motion, this may cause additional stress on your joints. The artificial pause in the downward movement of your leg also may cause the movements of your hip and knee joints to be out of sync, leading to greater stress on your knees. A machine that has a stance that is too wide is especially likely to throw off your biomechanics and cause you to take unnatural strides that stress your knees, notes the All Ellipticals website. Your muscle strength and knee joint function are important factors to consider if you want to avoid worsening injuries during elliptical workouts. For example, if you have a muscle imbalance in your hip and thigh, you are at higher risk for knee pain when using an elliptical. The cause of your knee pain may be as simple as going at your workout routine too hard or doing too much too soon. If the pain is above your kneecap, you may have an overuse injury called quadriceps tendinitis, in which the tendon that attaches your quad muscles to your femur just above your kneecap is inflamed. This overuse injury is common among people who get into an exercise routine too quickly without first building a fitness base and among people who do lots of rapid acceleration and deceleration, such as high-intensity interval training on the elliptical. If you feel your pain on the outside of your knee, you may have the overuse injury known as iliotibial band syndrome. It's caused by friction of this band over your knee and hip joints while running or performing other repetitive motions. This is common among women, who tend to have wider hips than knees. Read more: Is Step Exercise Bad for the Knees?